Due to a vast invasion of websites over the internet these days, it has become a great task to capture and withhold the internet users to visit your website. If a website does not hold a good SEO ranking, it becomes troublesome to attract internet traffic. There is a growing need for exhaustive internet marketing strategies in order to propagate the websites and direct the mass users towards it and PPC service is one such tool. PPC (Pay Per Click) is an internet advertising proposition that works as a contract between the advertiser and the website owners. Promotional messages and advertisements are being placed over a website by the advertising company, whereby the advertiser pays the website owner a pre-decided amount when so ever the ad gets clicked. The price to be paid is fixed by the bidding system where the relevant keywords searched by the target market are taken as a base to decide the bids. This mechanism works as a two-way system, the advertiser can easily promote his product, service or a business idea through the medium of the internet and the website owner also makes good money when the ad gets clicked. A user’s click is of utmost importance here as it determines his attention and interest. Promotional advertisements are to be framed with due diligence and complete professionalism because low impression ads are sure to be neglected by the users. An expert PPC company can boost these internet marketing strategies and carry out a deeper market analysis to design ads in line with the target markets. A dedicated team then follows up the task and controls the proper display of ads and resolve when queries are made. We at Gcreationz advertise your website across all social media outlets and devise a suitable plan according to the business genre. Our team of dedicated personnel assures improvisation in online traffic capturing. Attractive advertisements designed incorporating all the relevant keywords. 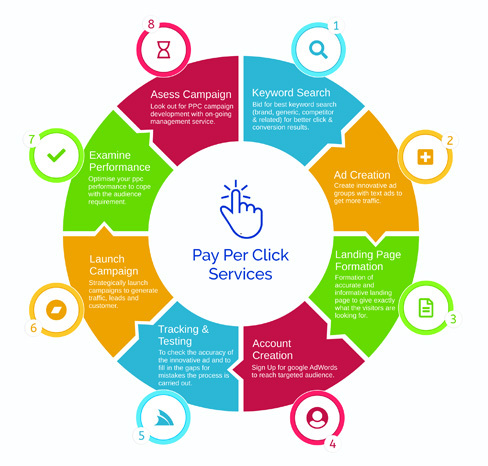 We are a competent PPC service provider and assure prominent results. Wisely formulated messages so as not to degrade the business image. PPC management services rendered for ongoing performance. Media managers offer quality service management. Timely completion of projects due to short durational contracts. The contemporary approach to penetrate the online market and reach a wider mass. Let's discuss your project idea with us!